Last Saturday, I was invited to check out the SEMBONIA Liberty Art of Geometry collection at Times Square. It's been many years since I last step foot in Times Square. I spotted this Mini Cooper near the front entrance of Times Square. On the day we took part in the #seflie but first we need to count the birds on the car. There's a form to fill in for that, it was only for last Saturday and Sunday. This year SEMBONIA SPRING/SUMMER, who doesn't want to get their hands on the Liberty Art of Geometry collection which brings out the bold drama into cool nonchalance, this is the new purity in pattern! SEMBONIA comes with innovative style of Geometry shape it's special as it also comes in floral and fauna which can at extra attraction. SEMBONIA outlet is available in Times Square. 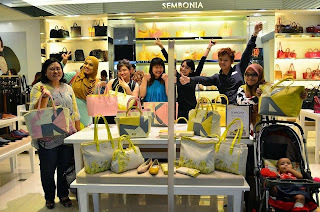 SEMBONIA bag is original from Singapore. If price range RM399 onwards is designed and manufactured at Italy. If lower range price from RM109 to RM299 or 50% to 60% is locally made/ China/Vietnam. 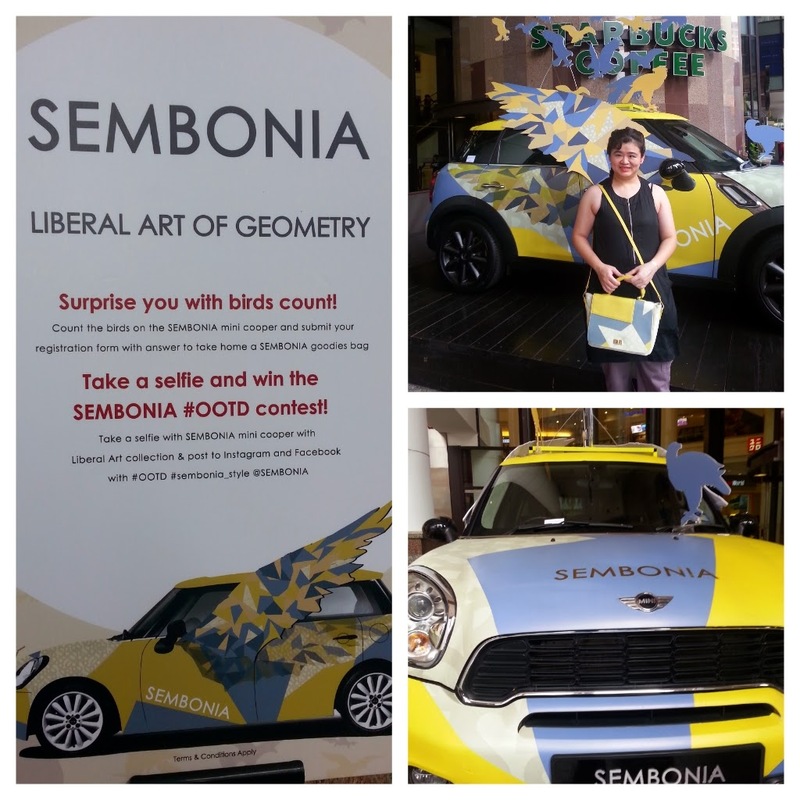 Cik Lily Putih is holding two of the SEMBONIA THE LIBERTY ART OF GEOMETRY. It comes with matte red and bright yellow color suitable customize for matching with confident. Wendy and Mommy Yana both loves polka dots, check them out with these beautiful SEMBONIA. Polka dots you can never go out of fashion with them, it was famous years and it's still up to date. Mommy Yana with baby in pram, being mommy I know having one bag is never enough. I like these bags, it has many birds, reminds me of counting the birds on the Mini Cooper car. I am mommy of two boys, so you know there's bag I need to put many things. My friends know I need many bags and often having item namely baby wipes, tissue pack, wallet, phone, sanitary pads, phone charger. I am sure you agree that with a paring of pale pink and bright yellow draws out the season's cheerful joy. As beautiful statement pieces, this season's offerings deserve to be cherished and worn fashionably with pride. The variety choice of the bags, shoes and other accessories is a sure getting everyone attention to grab a bag or a pair of shoes. Its power-packed combo of angular geometrics and sculptures lines denotes a try standout quality. SEMBONIA THE LIBERTY ART OF GEOMETRY certainly highlight the style and appearance. 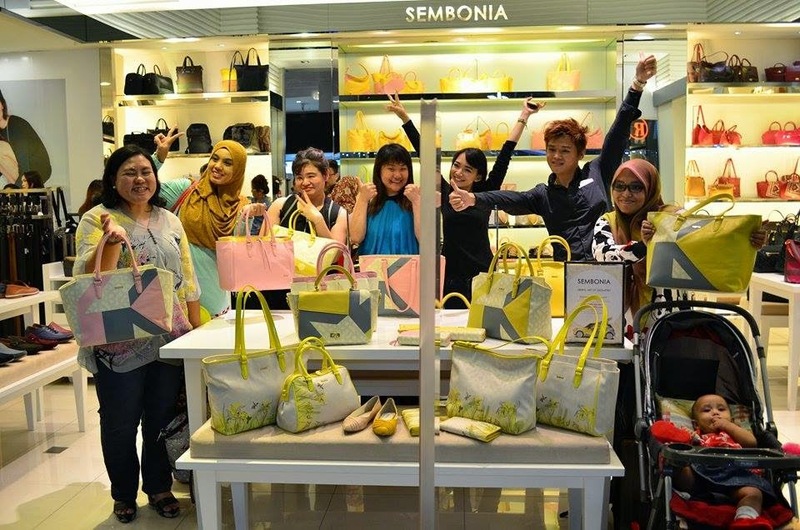 This is the group photo of bloggers in SEMBONIA outlet in Times Square. The bags are suitable for office, casual, formal and dinner events.